Forecasters are predicting large parts of the UK could be hit with record-breaking low temperatures at the end of October – and the cold snap is expected to last for FOUR MONTHS! Temperatures across the country are expected to plummet in the coming days and heavy snow and sub zero conditions could be the norm between November and February. 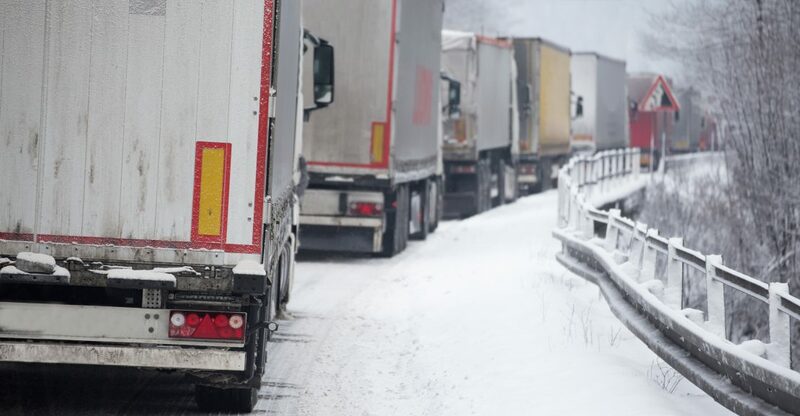 Scotland, Northern England and the Midlands are expected to feel the worst of the winter freeze and there are fears the situation could be worse than the Beast From The East that brought parts of the country to a standstill earlier this year. Talk of snow, ice and wintry conditions fills most drivers with dread. A combination of roads not being gritted properly and lack of knowledge on how to deal with the conditions can cause serious delays and gridlock. With the weather predicted to take a substantial turn for the worse, Cromwell Trucks has created an essential guide on how to drive and stay safe when the cold snap bites. Driving a dropside or tipper truck in cold weather can be hazardous, but there are a number of precautions you can take to protect yourself, your vehicle and other motorists. Be prepared. You can never be sure when the weather will take a turn for the worse so always carry a shovel, warm clothes, a phone charger, food and drink in case of emergencies. A shovel will help you get moving if you find yourself trapped in snow while the extra layers of clothing and food will give you the energy to see out a prolonged period of inactivity on the road. You should also plan a route that avoids steep hills and be aware that smaller roads may not have been gritted. Reduce your speed. You are less likely to cause an accident or slide off the road if you are travelling at a reasonable speed. Black ice is a particular hazard during the winter months. Maintain a safe distance between yourself and those in front of you. You never know what lies ahead of you and your braking distance will be reduced on icy or snowy roads. As Jerry Springer used to say “Take care of yourself … and each other.” Make sure you brake gently over longer distances. Stay alert. Avoid any sudden reactions on the road like braking, accelerating or steering. Keep it nice and smooth and be aware of what’s going on around you. Some traffic signs and road markings may become obscured so keep your eyes on the road. Remain cool at all times. You can avoid driver fatigue by maintaining a constant temperature in your cab. This will help you stay alert and avoid feeling drowsy if the temperature is too warm. Get the chains out. You could always do what they do in places like Canada and chain your wheels up, ensuring you have maximum traction in the snow. And when driving in the snow you should also use dipped headlights. Be careful. Are your truck retarders managed by ABS? If not you will have to be extra careful when driving downhill as your rear wheels could easily lock. Also be wary of driving an empty truck as you will have less traction. Don’t venture out unless you have to. Listen to the weather forecasts. If they issue yellow, amber or red weather warnings then heed their advice. If they tell you don’t hit the roads don’t do so unless you absolutely have to. Whatever you do, avoid revving your truck in first gear. Not only will this make a lot of noise, it could also lead to your wheels being driven further into the snow. There are a few ways to free your vehicle if you are snowed in. Firstly, as mentioned earlier, you could dig your way out, allowing your wheels to gain traction and set you on your way again. Alternatively you could engage your diff-lock, but make sure you disengage the function as soon as you get moving. Or you could try and move your vehicle in a high gear or switch between reverse and a forward gear to give you the momentum to get out.